A rogue vigilante seeks redemption in a lawless, near-future America that fully protects the rights of armed citizens to stand their ground against mass shooters and motorcycle gangs. Winner of a gold medal for Dystopia in the 2018 Readers' Favorite Awards and Best Western Fiction in the 2018 National Indie Excellence Awards. Listed in Kirkus Reviews Indie Best Books of the Month for April 2018. When a marksman known as the Wanderer opens war against injustice in the state of Arizona, his violent actions attract the attention of journalist Rosa Veras, writer of a subversive blog about America's return to the Wild West. As Rosa tracks the movements of the Wanderer, she exposes the new American folk hero's past sins and quest for redemption. But after making waves with a blog post connecting the nation's top gun manufacturer with its most violent gang, the reporter finds her life in danger and the Wanderer at her door. Rosa realizes she must join forces with the vigilante gunman if she is to live long enough to tell his story. 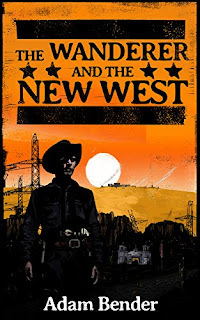 The Wanderer and the New West reinvents the Western novel with a dystopian outlook on a possible American future. It is a brand-new, stand-alone novel by Adam Bender, an award-winning tech journalist and critically acclaimed author of the We, The Watched dystopian sci-fi series about government surveillance.